I have used two tools to remove fingerboards; one is an antique clothes iron that does not have non-stick coating, the other is a special heating blanket made specifically for this purpose. I like the trusty old clothes iron as it will sit atop the frets, avoiding direct contact with the wood and still produce sufficient heat but the heating blanket heats a much larger area at one time. After heating the fingerboard and softening the glue seam I insert a non-stick wedge and work my spatula from one end of the neck to the other. Heating pad softens glue prior to removing fingerboard with spatula. 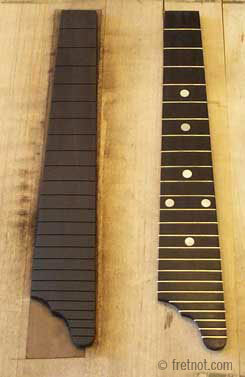 Because the neck and fingerboard are assembled before painting, separating the two breaks the finish line which will usually require touch up (some necks may require refinishing). Plastic inlays (not pearl or abalone) and binding can be damaged when heating a fingerboard and may require replacement. Fingerboards are available pre-slotted from sources such as LMI. Because accurate fret slot spacing is essential for proper intonation it is a true time saver to order boards pre-slotted. On occasion it is necessary to replace fingerboards that have been damaged by poor workmanship or are simply too brittle to be repaired. To replace or repair ? If it is a very old piece that would benefit from remaining original (rare, valuable, irreplaceable) then the extra effort to preserve it should be attempted. But I have come across a few 100+ year old boards that were simply falling to pieces, not only did removing the frets cause chipping but the force of installing new ones did as well. Ugh. If the instrument is a relatively new (30 years old or less), it is sometimes possible to order the complete fingerboard from the factory. Ideally these come bound (when needed), fretted, inlayed and ready for installation. Not all factories make this available and manufacturers normally only sell these items to their authorized repair shops. Gluing a new fingerboard on can be a pretty aggravating task. Not only do fingerboards slip and slide once glue is applied, consistent clamping pressure throughout the fingerboard is essential. a replacement fingerboard is made. For the purpose of positioning a fingerboard for regluing I use locating pins. In fact, some instruments have small pins in place for just that purpose. After drilling small holes thru two fret slots and into the neck these pins will help to keep the board in proper position while clamping. Because the tiny holes are made beneath the fret all evidence is concealed. I personally find the easiest locator pin to be a drill bit turned upside down. This way the pin and hole match exactly. I prefer to fret a new fingerboard after gluing it to the neck, this is a preference which can vary depending on the situation. Once glued, the fingerboard is radiused by specially shaped sanding cauls and fretted. Celluloid inlays are particularly prone to shrinkage. When this happens the inlays often come loose and can be a nuisance when playing. Loose inlays should be reglued to reduce the risk of loosing the inlay. While simple squares and circles are easy enough to replace, custom inlay shapes take far more time to reproduce. It is also more difficult to match some vintage material. If you are interested in wonderful custom inlay on your instrument I strongly encourage you to visit either Larry Robinson's Site or Bryan England's Custom Inlay site for more information. Shell inlay can be removed by heating with the tip of a soldering iron or other, pinpoint heat source. Once the glue is soft, pressure on the edges will cause the inlay to teeter and slide under it. Celluloid inlay is flammable and should not be subjected to direct heat. I usually warm these slowly from a hair dryer to avoid destroying the inlay, sometimes damage can not be avoided. Dot markers and common inlay shapes are available pre-cut and often come in a few color or material choices such as white, gold and black pearl. Inlay supplies are available thru Ebay and luthier supply stores.